hi. 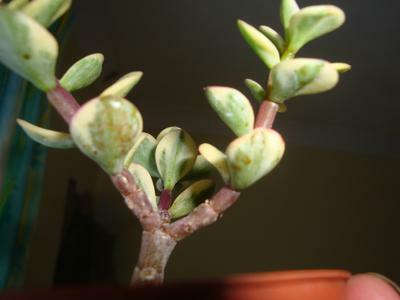 could you tell me why those brown margins on my Portulacaria afra variegata appears? when i recived this plant 4 months ago i noticed two whithe insect on the bottom of the leaves, i removed those insect, and i never had a problem with them again. The leaves with those margins dry out and fall off. Could you also tell me how often should I water this plant? at the moment I water only every 1.5 months, when soil is very very dry. Hi Aga, so, these margins that dry out are on the old growth, right? I really couldn't tell from the picture what you were referring to, as your plant actually looks quite healthy. Old growth quite often will fall off, that's normal. One thing you can do to help is to cut the plant back a bit, so it bushes out with more new growth. 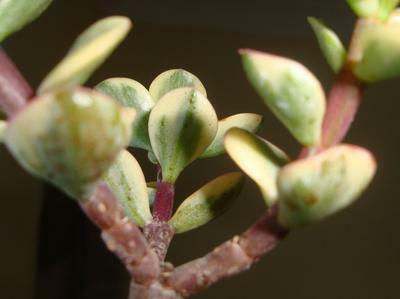 You can see more about how to prune succulents here. I always recommend that you use the parts you cut off to make a replacement plant (propagate it), just in case the original plant doesn't survive - in my experience, the new plant is tougher and more likely to adapt to your conditions. As you've just recently got this plant, it might take a while to acclimatize and start to grow. You're doing the right thing with the watering, but as the daylight lengthens you could start watering a bit more often. You say there was a white insect on the plant - I would watch for any juveniles of the insect, which could have been whitefly, and other pests that are common are scale, aphids and spider mites. Keep going - you're almost addicted now!